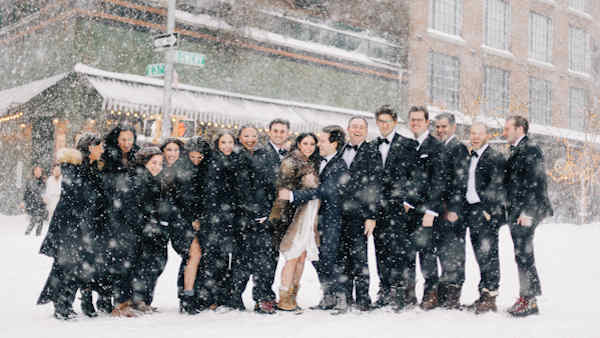 BROOKLYN (WABC) -- One of the largest snowfalls in New York City history forced a couple to push their Brooklyn wedding ceremony back a day, a logistical nightmare that was no easy undertaking and required the cooperation of several agencies. Danielle Borovoy and Daniel Greenberg were set to get married on Saturday, January 23rd, at 501 Union, but Mother Nature had something to say about that. "From the moment we got engaged, we wanted to get married in the winter," Borovoy said. "Not only because a year of planning felt like the right amount of time, but also because there's a sense of calm and time and space in New York." The blizzard not only dropped near-record amounts of snowfall, but it also closed bridges and tunnels, prompted a travel ban and shut down above-ground subways. And that left attendees staying in Manhattan and other locations with literally no way to make it to the venue. "I prayed for snow most of the year," she said. "What could be more romantic than a white wedding? We never could have imagined the first snow of the season would be smack on our wedding day, and especially that it would be a blizzard of epic proportions." After 18 months of planning, and lots of money spent, the entire black-tie affair had to be pushed back to Sunday. "Within half an hour, our parents and day-of coordinator got in contact with our all our vendors and the venue," she said. "A stroke of luck made both our venues the following day; all prior engagements has been cancelled due to the snow. The wedding would go on exactly as planned, only 23 hours later." The photographer, videographer, hair and makeup stylists all canceled plans for the next day to recreate that morning all over again. And of 140 guests, 110 rebooked flights and booked an extra night's stay at the hotel. Photographer Joseph Lin suggested the couple take advantage of the winter wonderland for once-in-a-lifetime wedding photos. "I had never seen a New York City like this before," she said. "The snow was so thick we could barely see in front of us. Our hair turned white. It was magical."